Minestrone from scratch. File under adulting. Growing up I would not have thought possible to find fascinating that bowl of greenish soup that represented part of our dinner at least four times a week throughout the year. The minestrone would come straight from a bag from the freezer, always the same brand as mum loved that perfect combination of vegetables, potatoes and beans which assured her a balanced minestrone, suitable to her taste. It was always accurately blended, as my mum doesn’t eat vegetables in pieces, but would make an exception for puréed ones. She would pour some extra virgin olive oil at the bottom of a pot – always the same one, with a burnt handle on a side -, then she would add the roughly chopped onion and invariably burn it.She would pour the frozen minestrone from the bag into the pot: I can still hear the hiss of the frozen vegetables touching the scorching hot olive oil. A quick stir, enough water to drown the vegetables and then she would cook it forever. Then it came the moment to purée the minestrone, first with an old school vegetable mill and after a few years directly with an immersion blender. The minestrone would reach that perfect undergrowth green that she was expecting. It would then be stashed in the fridge until dinner time. 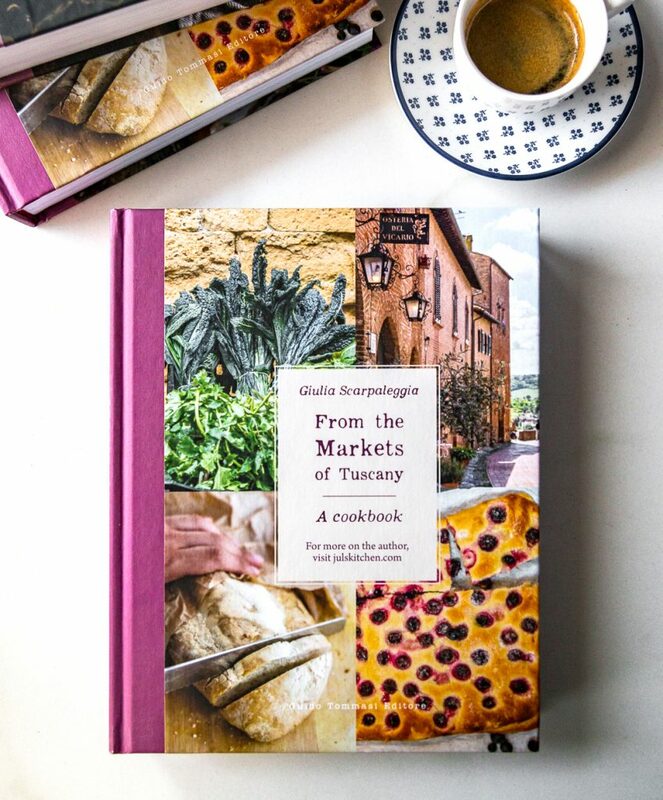 While she was setting the table – the tv was on the news, I was sitting at the table, either doing my homework or reading a book -, she would heat a portion of the minestrone, adding either rice, short pasta like tubettini or more recently a mixture of barley, spelt and rice. That greenish steaming bowl of minestrone would open our dinner. Mangia, che ti scalda lo stomaco! Eat, it will warm your stomach! Fast forward a few years and I was at the market in Florence in Le Cure neighborhood, where Tommaso used to live before moving in. I was eavesdropping a conversation. Apparently at the market the ultimate quest is to make a thick and creamy minestrone. You can often find bags of already cut vegetables to make your own minestrone. They change according to the season and the vegetables availability. The vendor was instructing a bunch of nonne queueing and waiting for their turn on how to give an extra kick to the minestrone. He was like a priest preaching from a pulpit, we were the faithful flock hanging off his words. You can add a couple of boiled potatoes to the minestrone. Just mash them with a fork and stir them in, you’ll taste the difference. If you prefer beans, just do the same. Purée half of the beans and pour them into the minestrone, then add the left whole beans, give a good stir and serve. Or, and he made a dramatic pause, add a heaping spoonful of pesto. In my book this is the best minestrone you can make. I still keep a bag of store-bought frozen minestrone in my freezer. I still invariably burn the onion just like my mum, it must be in my DNA, and I still make a minestrone which tastes perfectly just like it used to taste, a straightforward comfort food which made my childhood happy and simple. Since that preach, though, once in a while I make my own minestrone from scratch, buying all the vegetables I like, cutting them into regular cubes and freezing them in portions, to have it ready when I feel like having a bowl of comforting soup. I feel like a trustworthy grown-up. File under adulting. I found my preferred combination of vegetables which suits this season, at the edge in between spring and summer. 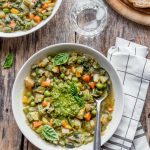 Even though you would imagine a minestrone suitable for a cold winter night, I find it ideal for these first summer nights, when you want something fresh, rich in flavour and with tons of good seasonal vegetables. I usually prepare all the vegetables and collect them into a four bags for the freezer, thus having enough minestrone for a few cozy dinners. Once the minestrone is ready you can add your twist to the basic recipe. Shell the peas and collect them in a bowl. Rinse zucchini, green beans, potatoes and carrots and cut them into equal cubes. Slice leeks, onion, spinach and Savoy cabbage and add them to the vegetables. Mix all the vegetables and collect into bags for the freezer. I usually cook a quarter of all these vegetables for 2 people, sometimes we have leftovers. Cover the bottom of a pot with extra virgin olive oil, add a sliced wedge of onion and cook until golden. Pour in the minestrone - fresh or frozen - stir to cover with olive oil and cover with water. Cook on low flame for about 30 minutes, util all the vegetables are soft. If it is too dry add more water. Season with salt and scoop into the bowl. Drizze with fresh extra virgin oilve oil and serve. You’ll need a cup of cooked beans, cannellini would be perfect. Purée half of the beans and pour it into the soup, then add the beans that you kept whole. Cook for about 5 minutes and serve with a slice of toasted bread, a drizzle of extra virgin olive oil and a sprinkle of black pepper. The protagonist is some basil pesto. You can make your own with basil, pine nuts, garlic, olive oil and pecorino, or buy a good one from the store. Prepare the minestrone and spoon a generous serving of pesto into each bowl. Drizzle with extra virgin olive oil and enjoy. When the minestrone is ready, purée it and pour it back into the pot. Add more water if it is too thick. Bring it back to the boil and add a handful of rice, or pasta, or farro, per person. Simmer until the rice, pasta or farro are cooked but still al dente and serve with a drizzle of olive oil. Before sharing some well needed link love, tell me how you make your own minestrone and how you like to make it extra special! Pesto? Beans? Potatoes? Or am I missing something? Felicity Cloake on pesto, as if you want to make your own, this is a good recipe. Felicity Cloake on minestrone, with rice. Another Tuscan minestrone, a farro soup, so thick you could spread it on toast. If you are curious about the other half of Juls’ Kitchen, here‘s an interview with Tommaso where you can learn more about the “tech guy”, photographer, taster and much more… Head over to Girl in Florence to read the interview! I’m spending more time on Pinterest recently, and here you can find my board on Comforting Soups. I might have found a perfect word to describe me: webtrovert. More on Me & Orla’s blog. This was a staple in my childhood too, “sopa de verduras” only vegetables, no beans, rice or pasta. I like to Cook it when I’m feeling sick or in need of some comfort food, but now I add some pasta or lentils to it. Here I can find all the chopped vegetables at the market every Friday, there’ even a guy who sells different kínds: poblano, corn and zuchinni, mushrooms and zuchinni flowers, and my favourite , potatoes and leeks. Can I use regular cabbage instead of savoy? Ciao Janis, yes you can use regular cabbage! let me know how it turns out!